As of 2011, I made the decision to no longer build or sell any bowed psalteries, yet I kept my website open in case I ever decided I wanted to pursue the path of lutherie again. As of 2014, I consolidated my (inactive) commercial psaltery site, Phantasy Psalteries, and merged it with my (active) building website, A Psimple Psaltery. What’s shown below is a snapshot to help preserve the original psaltery site and help give inspiration to others in their psaltery building endeavors! Hello, and welcome to Phantasy Psalteries! 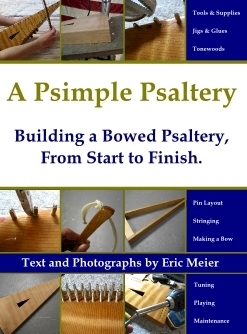 My name is Eric Meier, and I make a stringed musical instrument called the bowed psaltery. Whether this is your first time hearing of a bowed psaltery, or if you already own one (or more), I hope that by the time you leave my site, it will be with a new-found desire and intrigue for this unique instrument. When building bowed psalteries, I use a combination of science, art, woodworking, and most of all my own daydreams! Very often I am scribbling down new ideas and designs, jotting down any new thought that comes into my mind. Soon thereafter, I go to great lengths to make this fantasy into a reality; whether that be finding a new kind of wood or other material, learning a new crafting technique, or simply through trial and error. Whatever the reason for visiting, I hope that there will be something for everyone here. Whether you are shopping for a new bowed psaltery, curious to learn more about psalteries, or just want to look around at all there is to see in the world of Phantasy Psalteries, I hope that you will enjoy your visit!